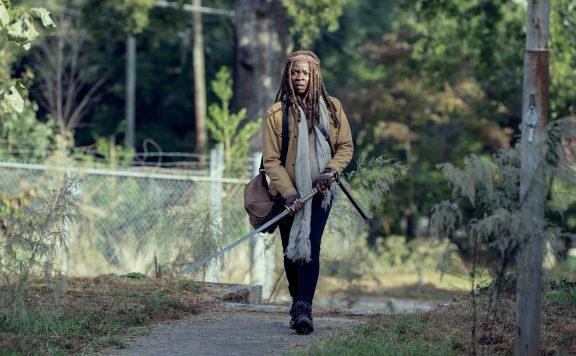 Part of what has been so successful with this season of The Walking Dead is the sense of danger that has returned. While some have been mixed on Samantha Morton’s Alpha, I do feel the Whisperers have given the series the right sense of menace in the way the Saviors didn’t. These villains have thrown us into the sort of dark territory we assumed the Terminus cannibals would be getting us into, were they not dispatched so surprisingly quickly. 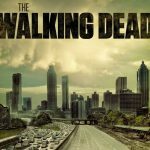 “The Calm Before” is an incredibly strong episode of The Walking Dead, as it finds the ways to hit a viewer properly. It delivers on the level of danger one wants to see and hits at emotions without feeling manipulative. The setup is pretty perfect, as even non-comic readers and those who merely watch the show week-to-week without delving further into it must be aware that something terrible is going to happen by the end. We even have an episode titled “The Calm Before” to make you extra aware that something is afoot. Regardless, providing the viewers with a happy couple celebrating an anniversary is the just the right kind of darkly funny way to get to the punchline, as we see blonde hair suddenly turned against the rest of the communities. 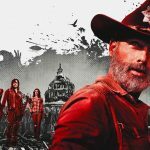 Everything after the opening credits becomes a real waiting game, as we know the Whisperers are going to strike in some devastating sort of way. That said, the build-up to get to the shocking moment is all about The Fair of New Beginnings (sorry Jerry, they changed the original title). 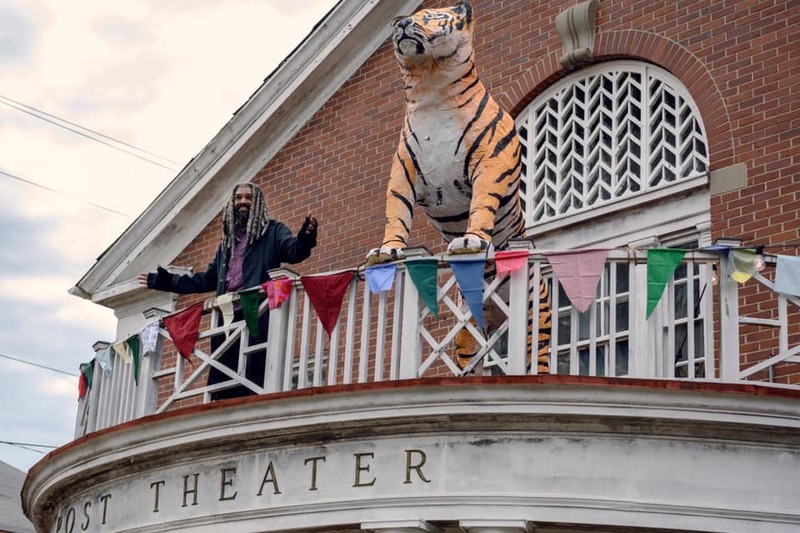 Following some great speechifying from King Ezekiel, we finally get to see the fair in full force, and it looks rather lovely. All of the communities brought food, clothing, trinkets, and more. Plus, there’s a dunk tank, candied apples, a musical performance for everyone to laugh at, and a movie to indeed wow the crowd. As Stefon would say, this fair has everything. It also has a lot of characters being set up for their demise. I will say, this episode did the work needed to keep me off guard from what to expect. It’s sometimes tricky to be a reader of the comics and try not to feel as ahead of the game as you may be, but I was pleased to be surprised by who was among the dead by this episode’s end. Before I say more on that, however, while watching the fair, it was just enjoyable to watch things fall into place. The community leaders had all come together to form a mutual protection pact, thinking they could be ahead on whatever potential attacks the Whisperers had in store. 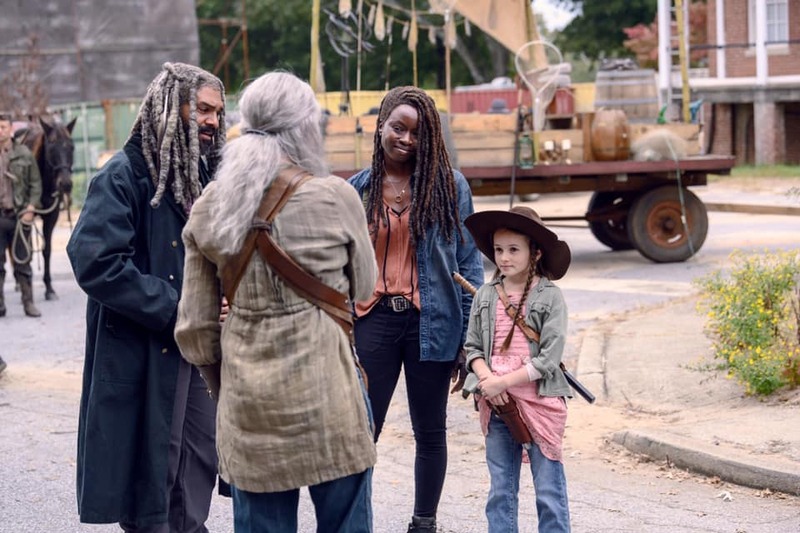 We also saw various reunions, thanks to the arrival/return of Michonne, Daryl, Connie, Henry, and Lydia. For all that we see of the fair, it helps to know the characters all wanted to be a part of it and deliver something that felt meaningful. This helps justify the long setup for this sequence, as well as feel even more essential in the grand scheme of things, even after tragedy strikes. 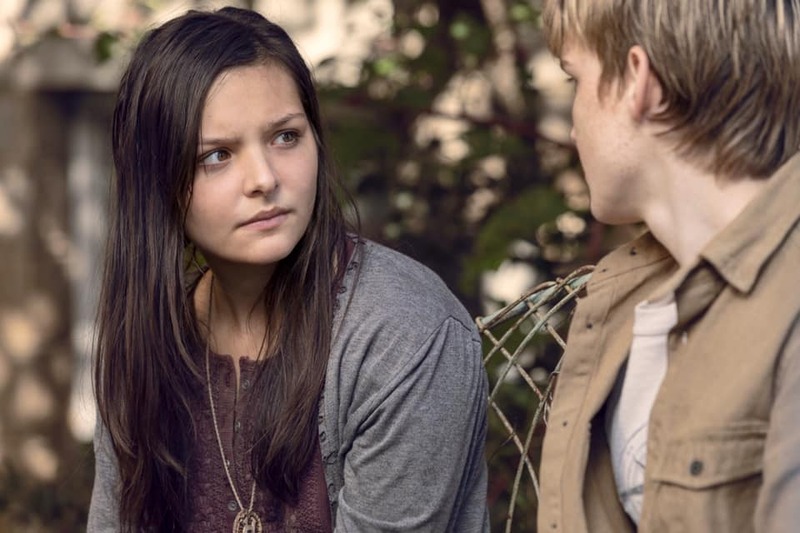 Bad things do happen, of course, as we watch Alpha slowly stalk The Kingdom, leading up to her meeting with Ezekiel, which certainly had me worrying. The icing on the cake was having Alpha sit down in the movie theater by Lydia, telling her to be quiet, one of the best commercial break moments I’ve seen on this show in some time. Some clever use of time splitting means getting our heavy hitters in their corner early. We see Daryl, Carol, Michonne, and Yumiko take down some walkers, only to be captured by the Whisperers. 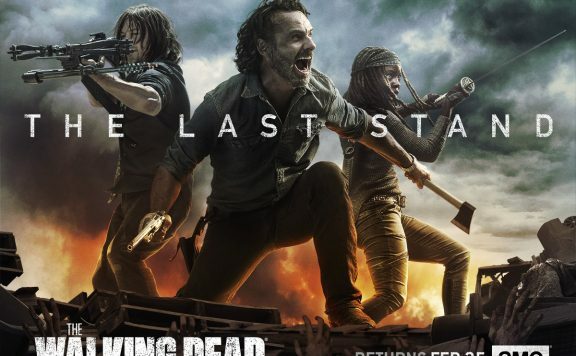 Knowing the show won’t kill off the three main leads right at this moment, it increases the sense of dread, as there was still a lot of episode run time left. As we jump back to see how the rest of the fair plays out, things continue to play out as needed. 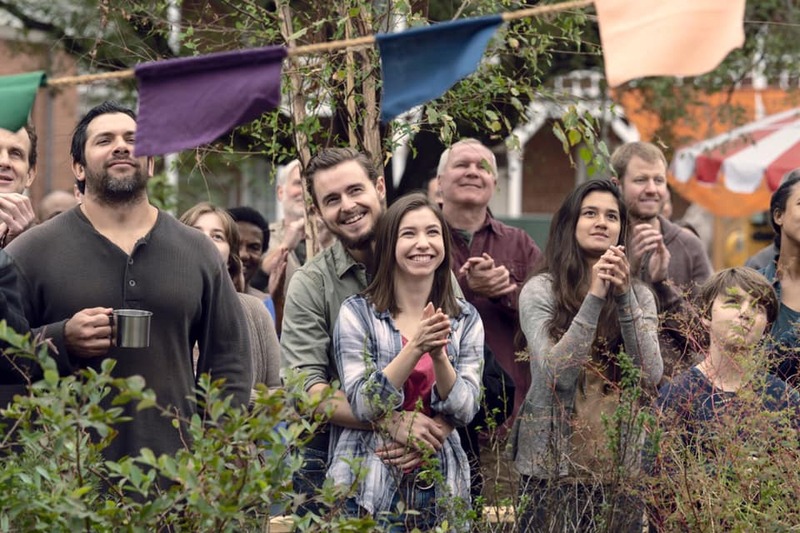 Perhaps a bit too much time spent on Tara realizing that she’s a great leader for Hilltop, as the episode basically tips this reveal, but it builds to the big reveal. Following another speech from Alpha, who tells Daryl to back off and keep their communities away from the Whisperers, we see how the border was marked. Henry, Tara, Enid, Tammy Rose, Rodney, Addy, Ozzy, Alek, D.J. and Frankie’s heads were all found on pikes, and it’s a devastating scenario. Sure, some of the names mean little to most, and even Enid seemed like a likely target at this point, but adding Henry and Tara to that list was quite the way to go. That’s the thing about this series. It found a way to build towards a notable moment in the series’ history that calls to mind the unpredictable way the show used to be. And not only do we see a large number of victims (bigger than ever when it comes to a mix of series regulars and other reoccurring folks in one swoop), but it happened with no depiction of the event. It wasn’t a series of drawn-out deaths; it was a matter-of-fact display of something terrible. Additionally, for all the crap we’ve given Henry, his death is meaningful to other characters. 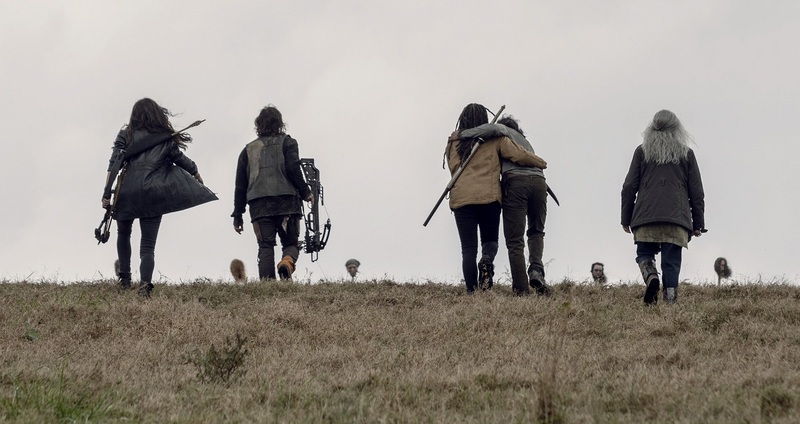 Tara is the most notable, as far as a character who has had a significant impact on this series (and the episode is annoyingly off in positioning her as the 2nd most important in terms of reveals), but Henry’s death will leave a mark on Daryl, Carol, Ezekiel, Lydia, and others. I may not have liked how this kid was built into being a rather annoying plot device, but taking him out in this way was about as effective as it gets. Fittingly, even without Rick Grimes on hand to give some big speech, we got one anyway, and in a manner that worked well. Saddiq was there when the victims lost out to Alpha and her crew, and while he relayed the message to the community, he also described the final moments of those who were killed. It’s handled with the kind of grace and respect one would want when speaking of such a tragic moment and I kind of love the way the episode finds a hopeful note to end on. We’ll see what happens in next week’s season finale, but for all the retribution that may occur, at least the communities are all on the same page. 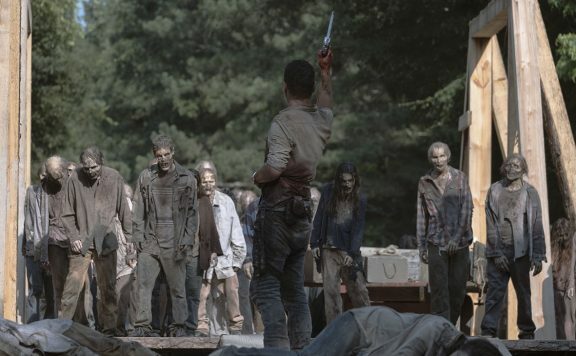 Zombie Kill of the Week: The search party gets in a good walker slaughter before the Whisperers come and take their toys. Of course Judith is great at hitting the dunk tank button. So, they show the animated Quackadoodle, but we don’t get to see what movie everyone watched! RIP Ozzy of the Highwaymen. Angus Sampson was a gift for this show, and now he’s gone. Meanwhile, the other kids were dicks…though poor Addy. The giant horde Alpha shows Daryl was a strong bit of visual understanding. Daryl knows Beta is still alive and I look forward to the rematch! Hilltop leader is not a great position if you want to stick around, just sayin’. Rosita is friendly with Eugene, but not enough to join in an RPG. Poor Enid never got to here her boyfriend sing. “I don’t think you can protect my daughter – but I hope I’m wrong.” – Alpha eventually tearing up is a wonderfully human moment for the character, and the fact that she kills one of her followers for seeing this is an excellent reinforcement of why she’s the alpha.